I’ve had a change of heart since I last wrote about Sew for Victory. Instead of a post-war Butterick 5281, I think I’d rather channel Rosie the Riveter on this one. Before war broke out, society had clear expectations of where a woman should be – at home. If she were to work, she shouldn’t earn more than her husband and marriage was meant to put a stop to any semblance of a career. But when World War II began, society had to buck up its ideas. 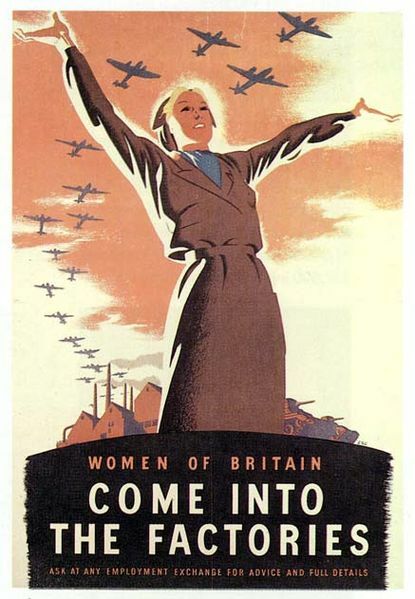 Suddenly, women weren’t just working in industries previously considered ill-suited for females, they were also actively encouraged to get stuck in as part of the war effort. In the UK, unprecedented amounts of women joined the industrial workforce out of sheer necessity. Between 1940 and 1945, in engineering alone, the amount of skilled and semi-skilled female workers jumped from 75% to 85%. The picture was very similar over the pond, as thousands of American women helped make machines and airplanes in their hundreds. It’s fascinating – while there are still problems with sexism in the modern workplace, we’ve come a long way from the idea of a female engineer being “radical” or just a plain necessity because of a shortage of men. For probably the first time since World War I, no one batted an eyelid at women carrying out so-called unfeminine work because they had more important things to worry about. When the war ended, it was automatically assumed these women would leave their jobs as the men returned. In London, the monument to the Women of World War II depicts 17 sets of uniform and clothing which represents the hundreds of jobs women undertook and then left at the end of the war. I think it’s safe to say, that while things didn’t change immediately, the work women did during the war began a shift in the perception of women’s role in society. The more I thought about this challenge, the more I wanted to pay tribute to that. Practicality is key. The plan is to make something which isn’t restrictive and which could easily fit in to the wardrobe of a 40s working woman. And hey – while I usually sit in an office most of the day, every now and then I have to do something silly like tramp around mud looking for evidence of fly tipping (this resulted in some embarrassing photos), so it wouldn’t hurt to have a smart yet practical item for any journalistic eventuality. Given my last-minute decision, I won’t be making trousers, because I’ve never made them before and I wouldn’t want to rush it! Instead, I’m going to take inspiration from Rosie and go for a classic shirt-dress. Comfy and non-restrictive, that’s the aim of the game! How are your challenges going? It’s just as well Rochelle extended the deadline on this one, phew! love your new plan – a timely post for me too because was only reading earlier today about calls to name a new bridge in Dublin after a woman in recognition of involvement in workers unions and such. No way! That’s exciting. I’d love to look properly into this someday.